It certainly doesn’t. Especially when the author happens to be J.D. Salinger: war hero, recluse, Hindu-Buddhist, manic-depressive, U.S. counterintelligence agent, and perhaps one of the most influential American writers of the 20th century. This year marks the 50th anniversary of Salinger’s “The Catcher in the Rye,” and sales are just as steady as when Holden Caulfield first infiltrated adolescent lives. Salinger’s first novel about an insurgent schoolboy and his romantic ideals became an international bestseller and continues to sell over 250,000 copies each year. It has never been out of print. What is it about this oft-banned cult favorite that keeps readers turning the pages and teachers listing it on their syllabus? 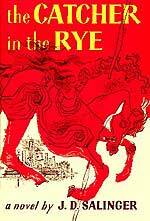 “‘Catcher in the Rye’ is sort of like ‘To Kill a Mockingbird,'” says Barnett, “in that it’s often the first classic that you really just love. You kind of fall in love with it.” It’s a nice coming-of-age story, says Barnett, that just about everybody can identify with in some way or another. The story revolves around a few short days in the life of 16-year-old Holden Caulfield, a rich kid from New York’s upper east side who has just been expelled once again from a tony private prep school. He goes to live in a hotel, hires a prostitute and drinks himself silly, wanders about town and ponders a life that isn’t quite what he imagined. With slang as edgy today as when first published, it is the coming-of-age story against which all others are measured. Measuring its value in the classroom wasn’t always that easy. Jerry Laffey, a former English teacher who retired in 1998 after 35 years in the classroom, was not allowed to use the book when he first began teaching in Onawa in 1963. Laffey said that the book was being read in the cities, but that Midwestern small towns were more conservative in their viewpoints then. Rather than raise somebody’s dander, he said, he didn’t fight the issue. Laffey said he felt at the time, it was a good book for people that age to relate to, and still feels it’s important today. Waldenbooks’ Larsen agrees. Born in Manhattan in 1919 to a prosperous Jewish father and Irish Catholic mother, Jerome David Salinger made his writing debut in “Story” magazine at the age of 21. He published short stories throughout the next decade, but after “The Catcher in the Rye,” he went into hiding. He became obsessive about his reclusivity, refusing almost all interviews and rarely going out in public. It fueled public interest even more. He has not published a book in 36 years, though rumors often speculate that he works under a pseudonym or will publish another novel. That well-guarded privacy was shattered last year when his daughter Margaret published “Dream Catcher,” a tell-all memoir that exposed her father as someone who drank his own urine, spoke in tongues, held his wife as a “virtual prisoner” and slept with teenage girls. Amazon.com called the book “balanced, thorough, and honest — sometimes to a fault,” and many reviewers agreed. This article first appeared in the Weekender on August 9, 2001.